We see each patient as a unique person with individual needs and desires. 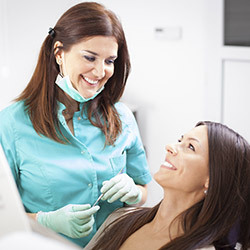 Our comprehensive examination allows us to partner with you to create a customized plan that will help meet your goals and optimize your dental health. Part of our responsibility as your dentist is to help you make healthy choices for a smile that will last a lifetime. Our diagnostic procedures consist of a five-point exam using the latest technology which includes digital photography, intra-oral cameras, and diagnostic radiographs. This comprehensive exam allows us to assess each patient’s jaw joints, chewing muscle status, teeth alignment, gum/bone structure, tooth decay, and potential for any form of oral cancer. You will leave our office understanding your current condition and be confident in your treatment plan. Our mission is to give you the opportunity for a future of optimal dental health.